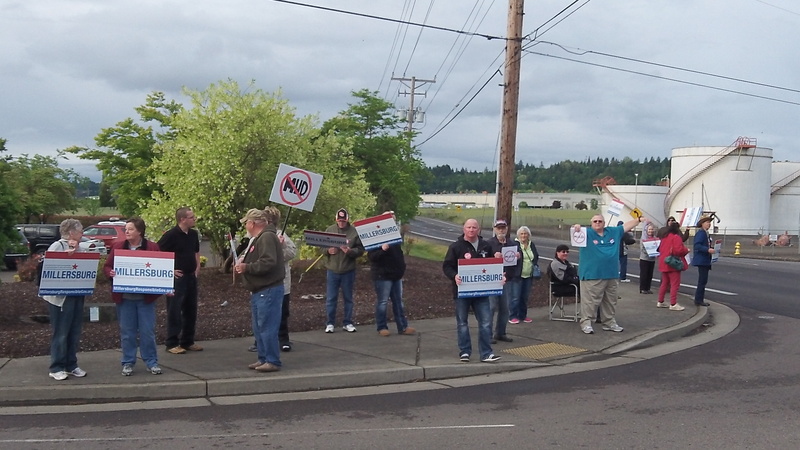 Citizens opposed to the power takeover demonstrate outside Millersburg City Hall Tuesday evening. The fight over Millersburg’s proposed forced takeover of Pacific Power’s electric business in town will continue for at least the next several months. Council members Darrin Lane, Jim Lepin and Clayton Wood, the longtime mayor, on Tuesday voted to put the power takeover before the voters. Opponents had urged the council to kill the proposal now instead of putting them through more meetings and another campaign on a plan they assert is opposed by the vast majority in town. But the council did the opposite. Lepin’s motion was without specifics, but City Attorney Forrest Reid says the election likely would not come until the general election in November. Before then, the council presumably will have to decide on the exact question on the ballot. Members might even turn it into an election to authorize around $40 million in borrowing. That’s the amount the plan’s backers estimate would be more than enough to condemn and pay for the Pacific Power system in Millersburg, build a new substation and transmission line and launch the city electric company. In March, Millersburg voted 519-62 in favor of an initiative to prohibit the council from borrowing large amounts of money without an election. The vote was seen as an indirect referendum on the electric takeover, but obviously it didn’t end the controversy. 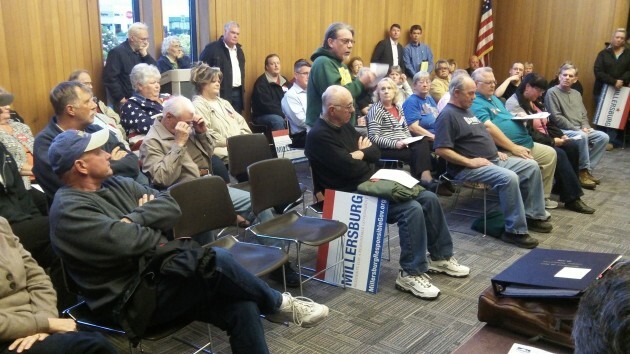 The audience waits for the Millersburg council’s decision Tuesday. Planning for the city utility was prompted and has been largely financed since 2012 or 2013 by ATI Wah Chang, the area’s biggest industry and the largest power customer in Millersburg. (People may still call it Wah Chang, but since last year its official name is ATI Millersburg Operations.) Pacific says Wah Chang has spent or will spend around $2 million for lawyers and consultants to move the plan forward. Millersburg won’t have to repay the money unless the utility is formed. What Lane and the two others (Councilor Lisa Metz-Dittmer abstained, and Scott Cowan was not there) voted to put before the voters is a “Business Plan for Millersburg City Power,” the product of a special committee formed by the council. The plan says that if Millersburg borrows and spends $40 million to start the utility in 2018 and amortizes the debt over 25 years from electric rates, consumers would have nearly $45 million in rate savings in the first 10 years compared to staying with Pacific Power. That’s based on estimates that Pacific’s rates would rise 5 percent a year, Wah Chang would be served by “market power,” low-cost power from Bonneville Power Administration’s hydro system would be available to the entire city by 2019, and BPA rates would increase 8 percent every two years and its transmission charges by 7 percent every three years. Among other things, the plan includes detailed tables of assumed savings. For instance, it says that in 2028, all Millersburg households would split $909,000 in savings on their electric bills, and Wah Chang alone would save $4.2 million. Pacific Power has dismissed the Millersburg plan as unrealistic, but Lane insists its numbers are conservative. He and Councilor Lepin, new on the council this year, also say that even if the voters give the go-ahead, the city would stop the venture if it costs more to get started than the voters authorize. HH, thank you for the fair report. One minor correction though, Councilor Lapin made the motion to send the issue to the voters, Councilor Lane seconded that motion.